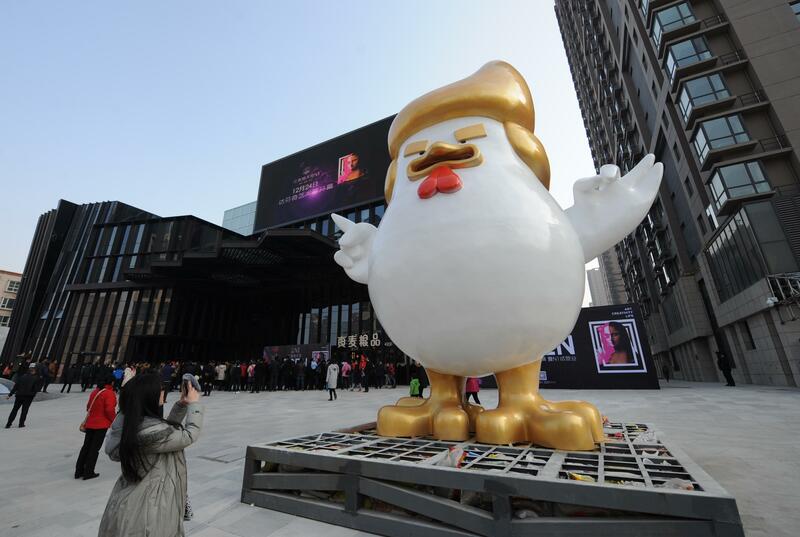 A giant statue of a rooster that looks like U.S. President-elect Donald Trump is standing outside a shopping mall in China. The statue was erected in Taiyuan, the capital and largest city of north China’s Shanxi province, and it heralds the upcoming Chinese Year of the Rooster, according to China’s ruling Communist Party’s People’s Daily. The designer said the piece was inspired by Mr. Trump -- his gestures and hair. The company that owns the mall had commissioned the piece, said Cao Mingliang, deputy director of the planning department from the N1 ArtWalk Mall, CNN reported. And it will serve as the mall’s mascot. At least four stores are even offering replicas of the giant rooster. They vary in price, starting as low as $57 and climbing as high as $1,739 for those seeking a 32-foot figure, according to CNN. Another bird bearing resemblance to the U.S. president elect drew attention in China just last month. A photo of “Little Red,” a pheasant with golden feathers, went viral when a journalist from Hangzhou noted that the bird -- at a Chinese safari park -- looked similar to the incoming president, Reuters reported, citing People’s Daily. “After comparing it with the photos ... we’ve found that not only are their hairstyles alike, their eyes’ expressions are pretty similar,” Gao Hongqiang, the head bird feeder at the Chinese park, told Reuters.